I mentioned in Weekend Things that I'm in the process of getting together a month of freezer meals. Many of you seemed interested, so I thought I'd take you with me along the way as I figure the whole thing out. Planning the "big cook" (any Breaking Bad fans in the bunch? ), as I'm calling it, has taken a bit of thinking. I've seen all sorts of plans for freezer meals and promises that range from a cleaner kitchen to money saved on groceries. Thing is, a lot of these recipes aren't vegetarian or vegan. And if they are, they haven't necessarily been written by vegetarians. 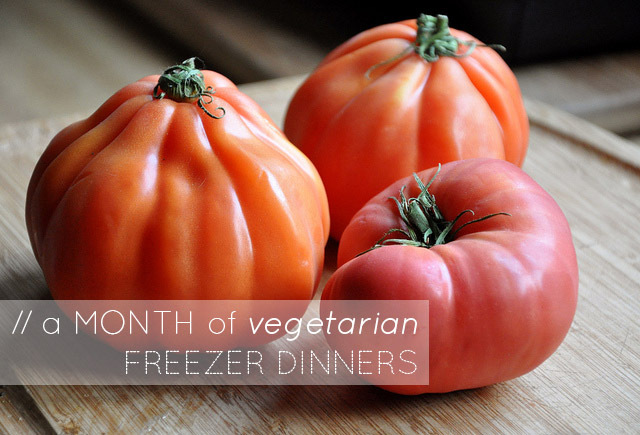 So, I've finally taken the time to wrap my head around how this seemingly magical solution -- a month of vegetarian freezer dinners -- could work for our family. I'm hoping we'll . . .
Save money by buying our ingredients purposefully + using them -- without waste -- in various recipes. Eliminate a load (quite literally) of dishes each night, saving us water money and time. Free up time during the day that I can use for my freelancing projects and, more importantly, doing things with Ada. Have more time together as a family during the work week with our meals decided + already made in the evenings. Improve the nutritional content of our meals by planning accordingly and boosting with lots of protein. Create some delicious, satisfying recipes that will become new family favorites. I'm focusing mostly on dinners Monday through Friday for the first month, as cooking oats for breakfast and slapping together a sandwich aren't terribly labor intensive. I also want freedom to cook on weekends because that's what I love doing. I'd miss it! I do think I'll make a gigantic batch of homemade freezer waffles. Who knows. I could get carried away, which would actually benefit me in this situation. We'll still be heading to the store/market at least every other week to get Ada's milk and other items (like fresh fruit and our CSA share). Actually I am a bit concerned about how we'll be using our CSA share if I cook our meals ahead, since dinner is when we use the bulk of these ingredients. However, I figure I can just can or freeze different items for the next month, too. I am also worried somehow I'll spend more at the store. So, using my handy grocery app will be helpful in projecting the costs. And will cooking everything in a single weekend be totally overwhelming? When I was pregnant, I made a gigantic batch of chili one weekend and it was a bit much. I haven't made final decisions on recipes yet, but I'm thinking -- again, just for the first month -- of being relatively repetitive from week to week. Like Monday night is X night, Wednesdays are for X, etc. It sounds formulaic and perhaps boring, but it's what we're already doing while making from scratch every night. I'll be sharing this information next Monday, after I cook everything. So, the "big cook" will be going down next weekend. Before then, I need to clean out our freezer, go through the ingredients we already have on hand to make stock, finalize the meal options, write out a master grocery list, and . . . go shopping. If I sit and think about the possibility of having our week-night dinners made for an entire month, I get pretty giddy. Don't you? What would you most hope to gain from making dinners for an entire month?